Skoda Cars Fan Club Russia is an informal community of Skoda car owners in Russia. 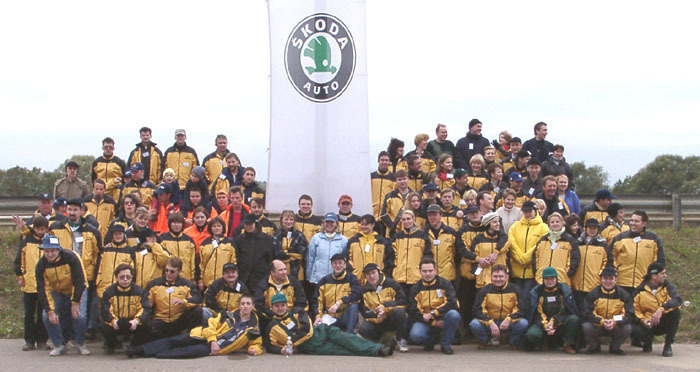 Our birthday is 22 May 1998 when the first meeting of Skoda car owners from Moscow and suburbs took place. Initially Club has arised as an organization for sharing the experience in Skoda car usage. Later it became an instituition representing the interests of Skoda car owners as well as a place where club members could advise and help each other in the maintenance, service and repair of their cars. Club's membership is absolutely voluntary. Since its establishment Club has united more than 600 owners of Skoda cars. Now we have members from Russia as well as Russian speaking persons from CIS countries, Norway, Israel and Czech Republic. In Moscow region we do have our own "911" service - SMEL (Skoda Moscow Emergency List) to help Club members in emergency situations. The Club has a very good relationship with Skoda dealers in Russia which helps its members to get the best service available. We have a meeting point at one of the most famous Moscow regions - Vorob'evi Gori (Vorob'ev mountains) - that is where active Club members meet regulary to discuss and plan Club's activities and just to talk about Skoda news and their own car performance. Club members often go outside of Moscow for a short ride or a long trip. May 1999. Moscow - Suzdal. 10 cars, 400 km. July 1999. Russia - Czech Republic. 3 cars, 5500 km. October 1999. Moscow - Kostroma. 10 cars, 800 km. January 2000. Moscow - Sergiev-Posad - Chernogolovka. 10 cars, 200 km. February 2000. Moscow - Istra. 7 cars, 150 km. June 2000. Russia - Czech Republic. 37 International Skoda-tour. 1 car, 5000 km. July 2000. Russia - Finland - Norway - Sweden. 3 cars, 7500 km. August - September 2000. Rally «Skoda-tour 2000», Moscow outskirts, 30 cars, distance - 100 km. November 2000. Moscow - Vladimir - Gous Khrustalny. 15 cars, 600 km. January - February 2001. Rally «Skoda-tour Winter 2001», Moscow outskirts, 35 cars, distance - 100 km. 29 April - 2 May 2001. Moscow - Pskov. 9 cars, 1500 km. June 2001. Russia - UK. 38 International Skoda-tour. 3 cars, 7000 km. September 2001. Rally «Skoda-tour Autumn 2001», Moscow outskirts, 39 cars, distance - 100 km. Since our Website is oriented to Russian speaking audience the following links should help you to find some pages you could look at. Those are pictures from our events/activities (please scroll down at that page to see the links).